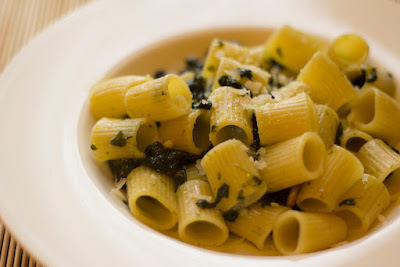 Spinach pasta, It just takes 25-30 minutes for 4 peoples. To make spinach pasta we need some ingredients as follows. First take little big round pot and boil the water, when water gets boil add 1-2 teaspoon salt and penne pasta, cook for 10-15 minutes then strain the water. Now start the white sauce preparation, for that take karahi and heat the butter then add some white flour and cook a for1 minute on slow flame. Then add hot milk, when it looks like smooth sauce add some salt and black pepper powder as you require. In second karahi heat, olive oil then adds chopped garlic and mushrooms and roast when mushrooms get soften then add chopped spinach and cook add salt if required. Now add cooked pasta and white sauce, mix these ingredients on slow flame then mingle the Italian seasoning well, take a taste if salt required add it. Take out on a serving plate and adorn with Italian seasoning, cheese, and chili flakes. And here is our spinach pasta is ready to serve.